In this episode of “Creative in Business,” you’ll discover the 7 most common mistakes made by creative business owners & entrepreneurs. This show is for you if you’re a creative in business looking for tips & ideas to help simplify running your business so that you can be more profitable, work with clients you love while creating more time for yourself, so you can spend time with friends & family in doing the things that you love! Enjoy freedom, flexibility & fun in your business. Embrace your creativity – use it in your business & use it to direct and run your business. 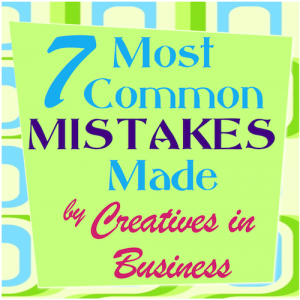 You’ll learn the most common mistakes creatives in business make – 7 mistakes that may be keeping you stuck, keeping you from creating a breakthrough in your income or with the number of clients / customers you serve or the amount of time that you’re spending working in or on your business. Kelly also shares ideas on how to keep from making these mistakes.